Museum Balla Lompoa is a reconstruction of the Palace of Gowa Kingdom, which was established by the King of Gowa the 31th in 1936. The architecture is typical of the Bugis-shaped house; the houses on stilts made of ironwood (Eusideroxylon zwageri). Built on an area of one hectare bounded by a high wall, Balla Lompoa that shaped like a house on stilts was originally a royal palace that been built in 1936 by Mangngi-mangngi Daeng Matutu, King of Gowa XXXI. Balla means "home" and Lompoa means "big". 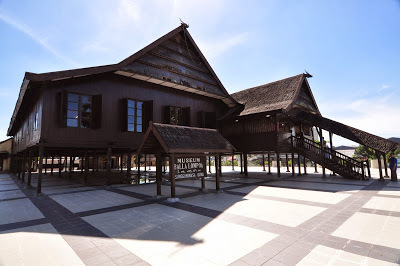 This Balla lompoa that was built based on Makassar architecture is including the world's largest stilt house. This building is consists of two parts, the main room that measuring 60 x 40 meters in which there are private rooms for the king, storage for historic objects, the cubicle kingdom with an area of each chamber measuring 6 x 5 meters, and a terrace room (reception room ) that measuring 40 x 4.5 meters. The building is equipped with a lot of windows that becomes the hallmark of Bugis house, and it has each window size for about 0.5 x 0.5 meters. This museum is a place where a collection of Gowa heritages been storage. Balla Lompoa Museum is located at Jalan Sultan Hasanuddin No. 48 Sungguminasa, Somba Opu, Gowa, directly adjacent to the city of Makassar. One of collections from Museum Balla Lompoa Gowa form are diverse types of Badik or Badek, a traditional weapon from Bugis and Makassar. Badik is a Sharp-edged dagger that can be single or has two in length, up to half a meter. Those Badik were often decorated by ornaments on its blade. Other weapons are machetes, spears, and there is also a weapon that became symbols of the kingdom. Other collections from Museum Balla Lompoa Gowa are ceramics, earthenware barrel, trays, candlesticks, kettles, bowl, which is partly made of gold; there is also drink jar and ceramic bowl that been displayed at this place. In addition to red and yellow colors that dominate the color of the fabric, there is also a creamy white color on a pedestal and the ornament curtain. Another collection is VOC pistol, bullets round with a variety of sizes, cannons and flags bearing yellow rooster. Sultan Hasanuddin is a National Hero that being dubbed as a Rooster from the east. The figure rooster emblem is also used in Gowa.